What do you do, when you go through an unpleasant experience, or when someone tells you something you do not like? Do you keep thinking about the event or the words said? Do you go on playing the same scene in your mind over and again? One of the stories in the book “101 Zen stories” speaks about this matter. It is a story about two monks, who were walking from one village to another. On their way, they arrived at a large puddle full of mud, which they had to cross. A young woman was standing at the brink of the puddle, not knowing what to do. “Do you want to cross the puddle?” One of the monks asked her. “Come”, said one of the monks, “I will carry you to the other side”. He took her on his back, and carried her to the other side of the puddle. 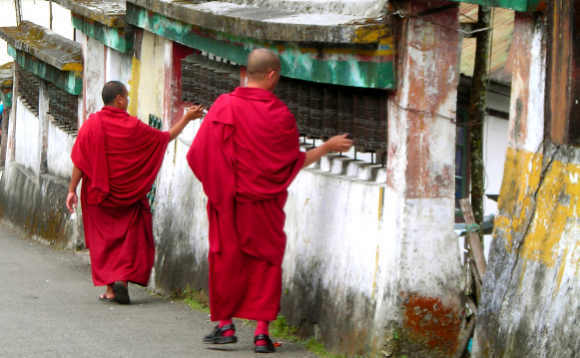 After crossing the puddle, the two monks continued walking silently for hours, until they reached their destination. This story speaks about the importance of detachment. One monk did what he did with detachment. After carrying the woman to the other side, he did not spend even a moment thinking about this matter, and kept his mind calm and focused on the road. The other monk thought that it was wrong to touch the woman, and kept thinking about the incident all the way, instead of keeping his mind quiet. The first monk did a good deed, and forgot about it. The second monk wasted a lot of time and energy thinking about what the first monk did. Examine your life, and try to figure out how many times you dwelled and fretted about what someone said or did. How many times you felt hurt, or spoiled relations, because you took things too personally. Thinking over and again about the past, repeating unpleasant and negative thoughts in your mind, and letting anger and unhappiness occupy your mind is like carrying a heavy load on your back. It is important to let go of these thoughts and learn to display a certain measure of detachment toward them. With a certain degree of emotional detachment, you will be able to clear the mind of the unnecessary and disturbing thoughts, and bring into your life a sense of freedom and happiness. Pay attention to your inner conversations, and to the thoughts that you keep repeating in your mind, and you will discover how much time and energy you waste thinking over and again about past events, or about what people said or did. Learn from the past and then stop dwelling on it. Learn to focus on the present moment instead of the past. You cannot change the past, but you can make the present moment happier and enjoyable. Focusing on the present moment, enjoying it, and doing your best, ensures the creation of a better future. You can learn to free your mind from the past and from unnecessary negative thoughts. This is possible with the help of detachment, controlling your attention, and focusing on the present moment. This would removes any heavy load from your back, and bring peace, happiness, joy and a sense of freedom into your life.